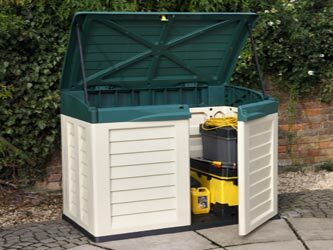 A perfect alternative to timber, this 4'8" x 4'8" Plastic Garden Store, made from a tough and durable polymer, eliminates chances of rot or rust, and provides a low-maintainence choice for garden storage. A lifting lid gives easy access while ventilation panels, double doors and a sturdy floor complement the building. Supplied flat packedd: no tools are needed for a quick assembly.